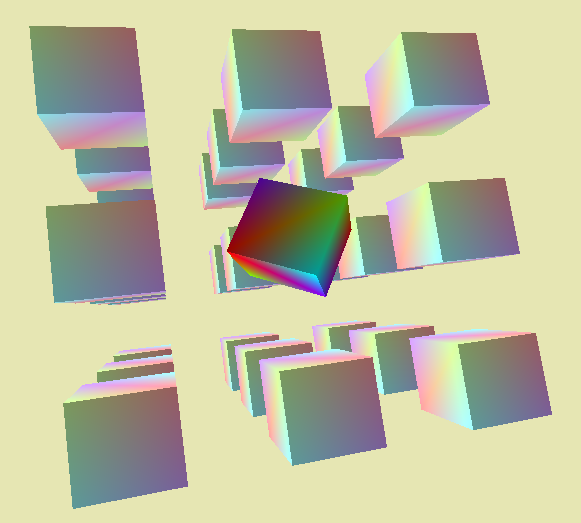 I am writing 3D graphics software in Java using the LibGDX framework (which is a front-end for OpenGL), and am baffled by a transformation problem. How do I rotate the orientation of the camera or models being displayed by the dx and dy inputs from a mouse? I want the object to rotate in the direction it is dragged by the mouse, no matter which direction it happens to be orientated at the time. As it is now, when I first drag the mouse to the right, the object rotates to the right about the screen Y axis as expected; but then when I drag the mouse upward I want the object to rotate upward about the screen X axis, but instead it spins to the left about the screen Z axis. Think of it like a floating ball in a bowl of water - whichever way you swipe at it, it ought to rotate in that direction. It seems to me that the mouse movement is transforming the objects directly in their local coordinate system; but instead I think I need to transform the axis of rotation itself from the Screen Coordinate System into the Object Coordinate System before applying it to the object. I just can't figure out how to do it. I would really appreciate any insight or help to resolve this; I'm running out of hair to pull out... Thanks in advance. All are 4x4 matrices. Where model is your models transformations. To implement you can just separate out the view's translate and rotate during your draw. This preserves the existing rotation and translation in exampleObj->model as the function gets called continually applying small rotations. And assumes you'll be using Proj * View * Model. Not the answer you're looking for? Browse other questions tagged transformations computational-geometry or ask your own question.